All relationships, even the most successful ones, have conflict. It is unavoidable. Fortunately, our research shows that it’s not the appearance of conflict, but rather how it’s managed that predicts the success or failure of a relationship. 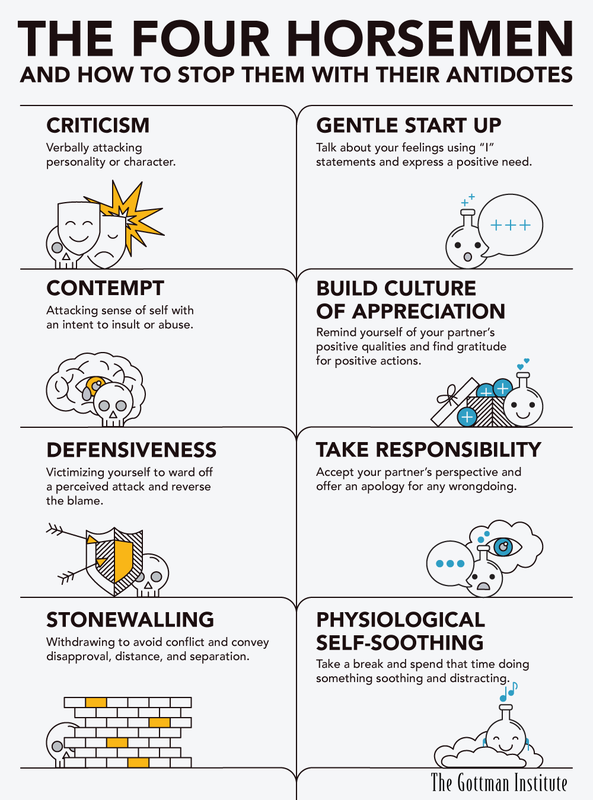 We say “manage” conflict rather than “resolve,” because relationship conflict is natural and has functional, positive aspects that provide opportunities for growth and understanding. 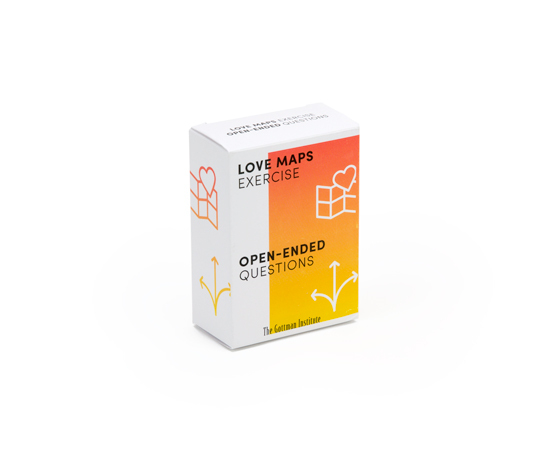 And there are problems that you just won’t solve due to natural personality differences between you and your partner, but if you can learn to manage those problems in a healthy way, then your relationship will succeed. The first step in effectively managing conflict is to identify and counteract The Four Horsemen when they arrive in your conflict discussions. If you don’t, you risk serious problems in the future of your relationship. But, like Newton’s Third Law, for every horseman there is an antidote, and you can learn how and when to use them below. You can download a free PDF version of the The Four Horsemen and Their Antidotes here. A complaint focuses on a specific behavior, but criticism attacks a person’s very character. The antidote for criticism is to complain without blame by using a soft or gentle start-up. Avoid saying “you,” which can indicate blame, and instead talk about your feelings using “I” statements and express what you need in a positive way. To put it simply, think of these two things to formulate your soft start-up: What do I feel? What do I need? Notice that the antidote starts with “I feel,” leads into “I need,” and then respectfully asks to fulfill that need. There’s no blame or criticism, which prevents the discussion from escalating into an argument. Contempt shows up in statements that come from a position of moral superiority. Some examples of contempt include sarcasm, cynicism, name-calling, eye-rolling, sneering, mockery, and hostile humor. Contempt is destructive and defeating. It is the greatest predictor of divorce, and it must be avoided at all costs. The antidote to contempt is to build a culture of appreciation and respect in your relationship, and there are a few ways to do that. One of our mottos is Small Things Often: if you regularly express appreciation, gratitude, affection, and respect for your partner, you’ll create a positive perspective in your relationship that acts as a buffer for negative feelings. The more positive you feel, the less likely that you’ll feel or express contempt! 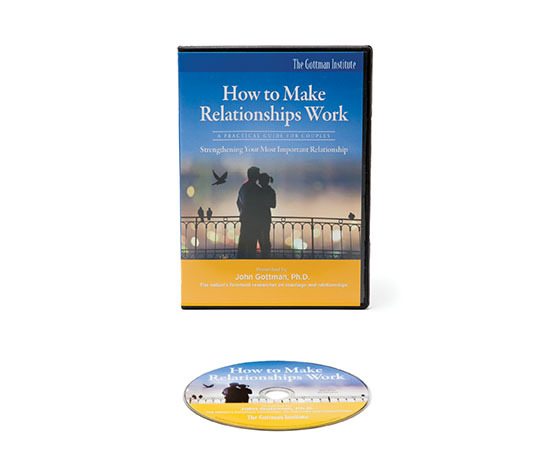 Another way that we explain this is our discovery of the 5:1 “magic ratio” of positive to negative interactions that a relationship must have to succeed. If you have five or more positive interactions for every one negative interaction, then you’re making regular deposits into your emotional bank account, which keeps your relationship in the green. The antidote here works so well because it expresses understanding right off the bat. This partner shows how they know that the lack of cleanliness isn’t out of laziness or malice, and so they do not make a contemptuous statement about their partner or take any position of moral superiority. Instead, this antidote is a respectful request, and it ends with a statement of appreciation. Defensiveness is defined as self-protection in the form of righteous indignation or innocent victimhood in attempt to ward off a perceived attack. Many people become defensive when they are being criticized, but the problem is that being defensive never helps to solve the problem at hand. Defensiveness is really a way of blaming your partner. You’re saying that the problem isn’t me, it’s you. As a result, the problem is not resolved and the conflict escalates further. The antidote is to accept responsibility, even if only for part of the conflict. By taking responsibility for part of the conflict (trying to leave too early), even while asserting that they don’t like to be late, this partner prevents the conflict from escalating by admitting their role in the conflict. From here, this couple can work towards a compromise. Stonewalling is when someone completely withdraws from a conflict discussion and no longer responds to their partner. It usually happens when you’re feeling flooded or emotionally overwhelmed, so your reaction is to shut down, stop talking, and disengage. And when couples stonewall, they’re under a lot of emotional pressure, which increases heart rates, releases stress hormones into the bloodstream, and can even trigger a fight-or-flight response. In one of our longitudinal research studies, we interrupted couples after fifteen minutes of an argument and told them we needed to adjust the equipment. We asked them not to talk about their issue, but just to read magazines for half an hour. When they started talking again, their heart rates were significantly lower and their interaction was more positive and productive. What happened during that half hour? Each partner, without even knowing it, physiologically soothed themselves by reading and avoiding discussion. They calmed down, and once they felt calm, they were able to return to the discussion in a respectful and rational way. If you don’t take a break, you’ll find yourself either stonewalling and bottling up your emotions, or you’ll end up exploding at your partner, or both, and neither will get you anywhere good. So, when you take a break, it should last at least twenty minutes because it will take that long before your body physiologically calms down. It’s crucial that during this time you avoid thoughts of righteous indignation (“I don’t have to take this anymore”) and innocent victimhood (“Why is he always picking on me?”). Spend your time doing something soothing and distracting, like listening to music, reading, or exercising. It doesn’t really matter what you do, as long as it helps you to calm down. You’ve got the skills. Use them! 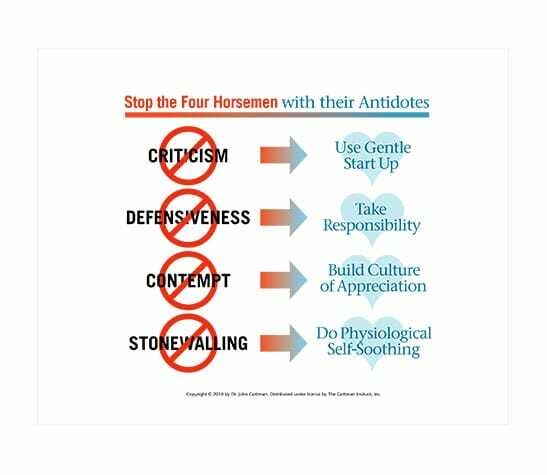 Now that you know what the Four Horsemen are and how to counteract them with their proven antidotes, you’ve got the essential tools to manage conflict in a healthy way. As soon as you see criticism or contempt galloping in, remember their antidotes. Be vigilant. The more you can keep the Four Horsemen at bay, the more likely you are to have a stable and happy relationship.